The DALI Input Unit is a fully DALI-compatible interface, designed to allow customer specified switches, sensors, time clocks or other on/off control devices to be incorporated into a standard DALI installation. The DALI Input Unit is a small, pre-wired, encapsulated PCB module and it is suitable for inclusion into all standard size back boxes together with a suitable mains rated switch. Through DALI Input Unit you can control even RGB and Tunable White luminaires. Module is designed to be used with standard push buttons – short-circuit connection is the active state. The logic of the module differentiates between short and long press of the push buttons. Short press is detected when the short-circuit detection lasts shorter than 1 second. For the reaction on long press it is possible to set whether the command should be sent only once or it should be repeated (for example UP/DOWN commands). If the short-circuit connection lasts longer it is detected as long press. User can configure different reaction to short and long press. The period of repetition is also settable (1 second period). DALI Input Unit is delivered with default configuration. 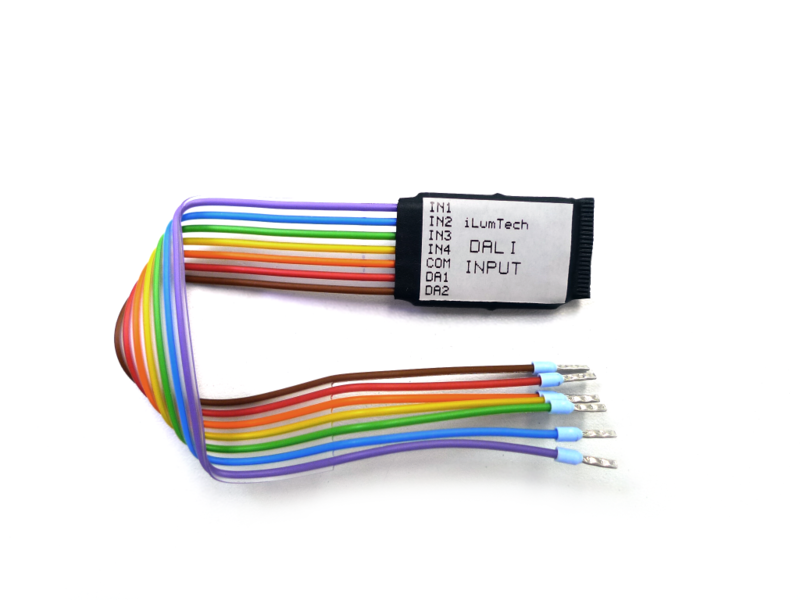 DALI Input Unit detects short-circuit connection between wires Input 1-4 and COM. Each input of DALI Input Unit can be configured with different DALI address (device support broadcast, group addresses and short addresses), for each input can adjusted three types of reactions: Static commands, Direct level or Toggle. In Static commands mode device transmit defined command each time a press is detected. The most useful commands are: MIN_LEVEL, MAX_ LEVEL, UP or DOWN. If desirable user can set up any command listed in DALI standard (IEC 62386-102). In Direct level mode device transmit defined brightness level each time a press is detected (for example 50%). In Toggle mode device toggles between two commands each time a press is detected. The user can choose from 3 toggle functions: MIN/MAX, ON/OFF and Scene X/ Scene Y. Scene X and Scene Y are settable number of DALI scenes which are toggled. The configuration can be changed using DALI/USB Bridge. DALI Input Unit is a DALI powered device therefore external DALI power supply has to be connected on the DALI line.